Dan Deacon, originally uploaded by jellybeanz. Two and a bit weeks of a ridiculous number of gigs followed by three weeks of nothing at all, and now an extended weekend of ‘festivals’: Hox to Dot on Thursday and the Brainlove alldayer on Saturday. Hox to Dot was surprisingly good fun. I had expected the venues to be rammed, but it was not too busy, and it was easy to get into any of the shows. The line up could have been busier, since there were a couple of moments where I had spare 15 minutes to fill, but it also meant that the evening wasn’t too rushed. What was tough was to get to work after only 5 hours sleep (at least that was still more than what I managed the night of Soulwax. An advantage of a multi-venue festival is the chances to watch things that I would not normally see. Juiceboxxx is one such example. An ‘MC’ performing over a synthy backing track, it could be something that would be terrible in practice. But it was actually enormously fun. Not that I would probably pay just to see him. On the other hand, going to see things only because you’ve seen the name about is also highly risky. I went to see Iglu & Hartly because they had been featured on Popjustice. They turned out to be a rap/funk/pop band, trying to sound a bit like the Beastie Boys but without the edge. There were some other great discoveries though. Oppenheimer were cute, like a more innocent version of the Postal Service. Cadence Weapon was the first point in the evening when the audience really got into the music. I look forward to seeing him again at Slottsfjell in July. The two acts I wanted to see in particular were Eugene McGuinness and Dan Deacon. Eugene McGuinness’s set was great, but at only 20 minutes long, way too short. His mini album is still getting regular plays, and the new songs sound pretty great too. Dan Deacon’s closing set was as much fun as usual, although the Macbeth didn’t work as well as a venue as The Dome did. Maybe it was because it was the end of a long evening on a school night, with a smaller crowd, the show wasn’t as crazy as the one in December. 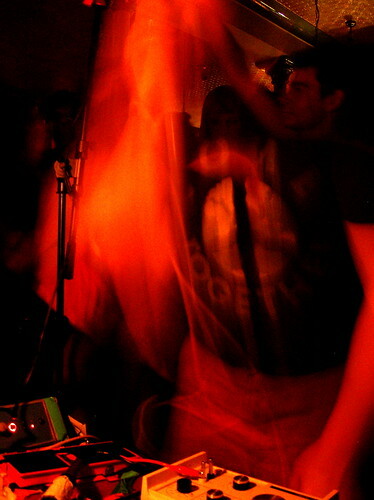 We still did get everything from a Dan Deacon show, the green skull, the interaction and of course the great music.